Good filament can be pricey, although the polymers the filament is made from aren’t that expensive. That’s the opening observation of a paper entitled “3-D Printable Polymer Pelletizer Chopper for Fused Granular Fabrication-Based Additive Manufacturing.” The authors argue that the markup can be avoided by eliminating the process of creating filament and instead 3D printing directly from polymer granules. Fused granular fabrication (FGF), or fused particle fabrication (FPF), they point out, is held back by the lack of accessibility to low-cost pelletizers and choppers. 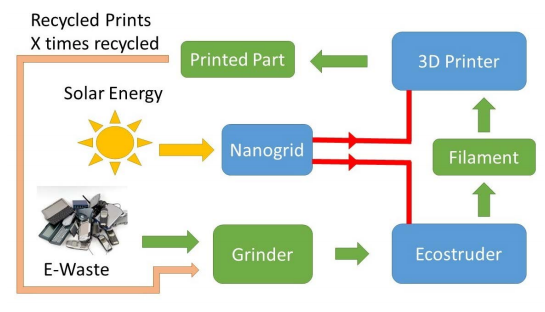 So they developed their own open-source 3D printable pelletizer that can process both single thermopolymers as well as composites. A single motor version of the system can be fabricated for only $185. All of the parts can be 3D printed with PLA or any other hard FFF thermoplastic, except for a few parts which are specifically designated to be printed with NinjaFlex. Step-by-step instructions are given for assembling the 3D printed parts. After assembling the machine, the researchers tested it with a number of materials: both 1.75 and 2.85 diameter PLA and ABS, as well as PP, PETg and coffee-filled PLA. They also tested NinjaFlex, but found that it was too flexible to be processed. A prototype Gigabot X 3D printer was used to 3D print the materials, and a self-designed “recyclebot” was used to create PLA filament from the pellets. Recycled material, such as PET and PP, can also be used from post-consumer materials, chopping up things like water bottles. Thermopolymers that have been shown to be acceptable for the recyclebot process include PLA, HDPE, ABS and elastomers, as well as composites such as waste wood biopolymers and carbon fiber-reinforced plastics. Future work includes replacing some parts such as the DC motor with cheaper alternatives, as well as working on geometric improvements that would allow flexible filaments such as NinjaFlex to be chopped. Authors of the paper include Aubrey L Woern and Joshua Pearce.